We haven’t seen the deeds of this house, which is obviously very old and built in the centre of the High Street in Thornbury near the old Market Place. We would love to hear from anyone who might know any more information or who might know where we can see some of the earlier records. We feel we haven’t done justice to this wonderful old building! The earliest source of information about the property is the 1840 Tithe Survey. This describes the property as Plot 64, a house and court owned by James Martin Baxter and occupied by Henry Davis. Henry Davis – we do not know the details of his birth, his marriage to Mary or their early life until the family came to Thornbury. We know that both Henry and Mary were born in Almondsbury according to the census records and that some of their children were born and baptised there. Their son, Henry was baptised in Almondsbury on 21st February 1819. There was also another son, George, baptised in Almondsbury on 31st December 1820. Catharine was baptised there on 9th November 1823, and ‘Rebekah’ was baptised there on 1st October 1826. The Davis family had moved to Thornbury by 1838 when their daughter, Anne Matilda was baptised there on 18th February. The baptism record shows Henry was a pastry cook. The Thornbury trade directories of 1839 and 1842 list Henry as a confectioner, baker and china and glass dealer. We are puzzled by Henry’s movements around this time. Although the 1840 Tithe Survey clearly shows Henry as occupying 20 High Street, the 1841 census appears to show that Henry was occupying a property a few doors down the street at 14 High Street. This is supported by the deeds of that property which indicate that a person with the surname Davis (fore name left blank) had occupied the property. Yet, in the 1851 census shows Henry as being back at 20 High Street and the 1859 Rate Book shows clearly that he is the owner of that property. In the 1841 census Henry was described as a pastry cook aged 45 living with his wife, Mary also 45, and children Henry aged 20, Catharine aged 16, Rebecca aged 13 and Ann aged 3. The Pigot’s Directory of 1844 lists Henry as a confectioner. In the 1851 census Henry was described as a confectioner aged 58 born in Almondsbury. Mary was aged 53 also from Almondsbury. Their daughters, Catherine aged 23 and Rebecca aged 21 were at home assisting their parents. Both girls were born in Almondsbury. We note that in the will of Joseph Laver dated 1856 he left a house in the High Street which was in the occupancy of Henry Davis to be sold. This property was located at 7 High Street. We suspect that Henry bought this property because he is shown as the owner of it in the 1859 Rate Book when it was occupied by his daughter, Catherine. The 1859 Rate Book also lists Henry as the owner of 20 High Street. His name was also shown as the occupant, but this was crossed through suggesting that he had recently moved away around this time. We note that Henry tried to sell 20 High Street in December 1859. He placed a private advert in the Bristol Mercury describing the property as a ‘Capital business premises comprising, on the ground floor a spacious shop, sitting room, kitchens and other offices and two underground cellars, on the second floor good sitting room and bedroom with good attics over. The Premises are well situate in the centre of the High Street and for upwards of thirty years past have been occupied by as a Glass and China Shop, and are well adapted for any kind of business. For further particulars apply to the present occupier, Henry Davis.” It is interesting to note that Slater’s Directory 1858/59 lists Henry as a ‘British Wine and China Dealer’. It doesn’t appear that Henry managed to sell the business at this time. He was still being listed as the owner in 1862, 1867, 1876 and 1880 Rate Books, although now renting the property to a plumber and glazier Aaron Burchell Marsh. The 1861 census shows Henry was now a widower and he had moved to London Road, Gloucester where he was trading as a china and glass dealer. Living with him was his daughter, Matilda aged 22 and two grandsons, George and Joseph Drinkwater aged 17 and 14 respectively. In the 1871 census Henry had moved to Wickwar where he was living in the house of his daughter, Annis and her husband, William Drinkwater, a shoemaker from Westbury on Severn. We think Henry died in 1879 aged 87. Annis Davis – married William Drinkwater in Gloucester in 1842. Catherine and George Davis – the trade directories of 1856, 1877 and 1889 show Henry’s daughter, ‘Miss Catherine Davis’ as a confectioner and china and glass dealer in the High Street. The 1861 Census shows Catherine living at 7 High Street. She was described as a confectioner aged 29. She had a visitor Elizabeth Mowat aged 39 who was the daughter of Thomas and Elizabeth Mowatt who had lived at 43 High Street. In 1871 she was living in the same place with her brother, George Davis. We are puzzled about George. The census says he was a baker aged 47 born in Kenn Court, Somerset. We know that Henry and Mary Davis had a son called George baptised in Almondsbury in 1820 but his age doesn’t fit with this George and we can find no record of him in any earlier census records. In the 1871 census Catherine was also described as a baker as was their cousin, Elizabeth Mowat who was unmarried aged 46 born in Thornbury. The three of them were still living together in the 1881 census although at this time George was described as a baker and confectioner, Catherine as a confectioner and Elizabeth as a housekeeper. The 1891 census shows Catherine was now running the confectioner’s business with Elizabeth. There was no sign of George. Elizabeth Mowat appears to be the one buried on 9th January 1893 aged 66. Aaron Burchell Marsh – the 1861 census shows Aaron was a plumber and glazier aged 48 born in Tockington. He was living with his wife, Emily, a schoolmistress aged 44 also born in Tockington. They had a boarder, George Williams aged 9 from Stratton in Somerset. Aaron was born in Tockington on 12th March 1812. He was baptised in the Thornbury Independent Chapel (now the URC) on 10th May 1812. His parents were Aaron Marsh, a glazier and his wife, Leah (nee Burchell) who were married in Colerne, Wiltshire in 1810. Aaron’s sister, Jane Florella was baptised in Thornbury Independent Chapel on 10th May 1818 (she was born on 4th January 1818). The 1841 census shows Aaron Junr living with his parents at 15 High Street, next door to the Swan Hotel. Aaron Senior was a glazier aged 69. Leah was 53. Aaron jnr and his brother, John, were both glaziers aged 27 and 18 respectively. On 30th October 1845 Aaron jnr married Amelia Robertson in Thornbury. Amelia was the daughter of Edward Oakley Robertson, a yeoman. Aaron’s father died in 1849 aged 78 and was buried in Hullavington, Wiltshire. The 1851 census shows his mother, Leah, was now living in Hullavington with her children Jane and John was described as a master tinplate worker. Aaron junior and ‘Emily’ had taken over his parent’s place at 15 High Street. He was a plumber and glazier and she was a schoolmistress aged 36. By the 1861 census they had moved to 20 High Street. Emily died aged 53 and was buried on 30th November 1869. The image on the left dated December 1862 shows Emily was running a private school at her property. The 1871 census describes Aaron as a widowed plumber glazier and gas fitter aged 59. He was living with his brother, John, who was a painter, glazier and tinplate worker aged 48 and a niece, Emily Jane, a housekeeper unmarried aged 29 and born in Bishopsgate, Middlesex. The 1881 census shows Aaron still in this property. He was a plumber and glazier aged 69. Living with him were his brother, Edgar W Marsh aged 66, unmarried sister Jane aged 63 and niece, Emily. Aaron Burchell Marsh was buried on 1st July 1881 aged 69. He seems to have been a man of many interests. On the 30th July 1881 there was a notice in the newspaper of the sale of the effects of the late Mr A B Marsh. 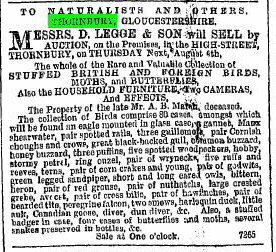 The effects included: “the whole of the rare and valuable collection of Stuffed British and foreign birds, moths and butterflies, also the household furniture, two cameras and effects”. An advertisement of 20th July 1881 for the sale of the shop “now in the occupation of the representatives of Mr A. B. Marsh says that it contains “a front shop and two workshops, sitting room, kitchen, underground cellar, three bedrooms and attics. This might suggest there had been some extension to the property since the description given above dated 1859 (which refers to only one bedroom). Edward John Ponting – the 1885 Rate Book shows Edward was new owner and occupier of the property. The 1891 census shows Edward was a plumber and gas fitter aged 31 born in Thornbury. He was living with his wife, Mary aged 33 from Alveston and their daughter, Beatrice V aged 2. Edward was baptised in Thornbury on 21st April 1859. He was the son of George Ponting, the relieving officer and his wife Marianne. In 1881 Edward had been living with his parents in 42 Castle Street, where his father was working as a water bailiff and gardener. In June quarter 1888 Edward married Mary Meredith in the Chipping Sodbury area. Mary was born in December quarter 1857, the daughter of Mark Crossman Meredith and his wife, Mary. In 1890 Edward went bankrupt with unsecured debts of £355 4s 10d. He had been operating as a plumber, glazier and gas fitter for about 10 years. He had set up the business with £30 capital, but he had borrowed a further £300, of which almost £200 had been spent on his house. He blamed his situation on insufficient capital and high expenses connected with County Court proceedings. In the 1891 census Edward and Mary were living at 20 High Street with their daughter, Beatrice Valentine Ponting baptised on 11 March 1889. Edward was working as a plumber and gasfitter. Following the death of her parents, Mary acquired the two houses at 7 and 9 St John Street which they had owned. She paid £140 for the properties on 21 February 1896. The Rate Books of 1899 onwards that we have seen reflect the fact that Mrs Ponting owned both these houses. Edward and Mary had three more daughters, Mabel Mary baptised on 4th October 1891, Hannah Ada Emily baptised on 4th March 1894 and Sophia Annie Victoria baptised on 5th December 1897. In 1901 Edward was listed as a plumber (shopkeeper) in the High Street. The Pontings were still there in 1911 and they are also shown in the 1914, 1915 and 1916 Prewett’s Street Directory and the 1918 and 1921 electoral registers. The 1925 Valuation list confirms that Edward still owned and occupied these premises. He died in 1926 aged 67. Mary was listed in the 1926 Rate Book as the owner of 22 High Street as well as 7 and 9 St John Street. The 1927 electoral register shows Mary had moved to Sibland Farm. Mary died aged 69 on 3rd February 1927. In her will dated 23rd June 1897 she had appointed her executors as Thomas Meredith – farmer of Earthcott Green and Edward Meredith. Edward had pre-deceased Mary, so it was Thomas Meredith who was left to sell 7 and 9 St John Street for £200. We do not know when 22 High Street was sold or to whom. Harry and Annie Lawrence – according to George Excell – ‘Mr Lawrence ran a fish & chip shop at now Nell Gwynn’s café with his charming daughters would serve 5d lots of scoopful of scrumps thrown in for regular customers’. The 1931 census lists Harry and Annie Lawrence in the High Street. 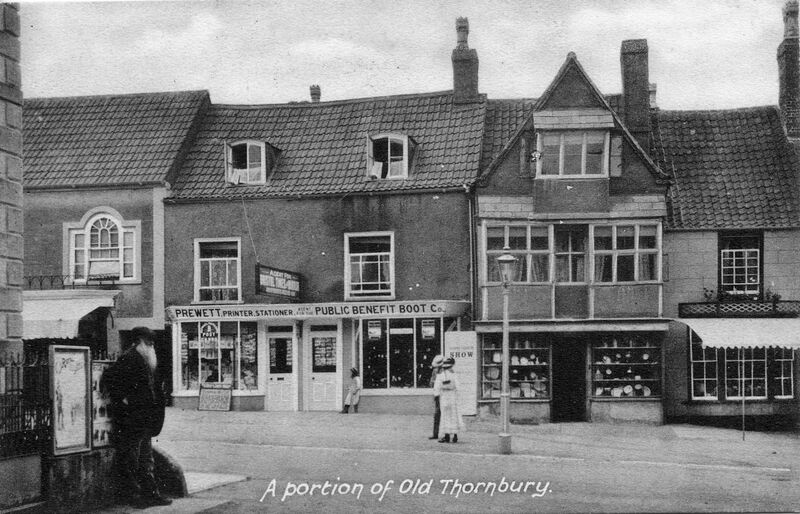 They had moved away from Thornbury by the time of the 1935 electoral register. Claude Stuart Browning – operated a shop known as The Curiosity Shop from 20 High Street from the mid 1930s to the early 1950’s. Claude was born in the Bristol area in 1903. He was the second son of Grantley Gilbert Browning and his wife Elizabeth Ann (nee Freebury). The registration of his birth in FreeBMDs is shown as ‘Claudius Stuart’. The 1901 census shows Grantley was the publican at The Golden Lion at Fishponds in Bristol. We don’t know when the Brownings moved to Thornbury, but Grantley is listed in the High Street in the 1918 electoral register and listed as publican of the White Lion in a 1923 trade directory. Grantley died on 24th November 1922 aged 52. We are not sure who took over the pub. The 1927 electoral register lists both Claude and his brother, Worthy Browning at the White Lion Hotel. The 1931 electoral register lists Claude and another brother, Leslie Grantley Browning at the pub. In 1932 Claude married Helen Mary Mathieson in Thornbury. Helen was born on 4th June 1909, the daughter of Mr and Mrs G Mathieson of Little Midmill, Kintore in Aberdeenshire. The 1935 electoral register lists Claude and Helen in the High Street and we assume that they are now living in 20 High Street as the Parsons family were living at the White Lion. Claude’s sister, Lily had married Herbert Parsons and she was largely responsible for running the pub. The special register compiled in 1939 in preparation for the war shows the Brownings in 20 High Street. It notes that Helen was involved with the Red Cross during the War. Claude opened a shop at 20 High Street as an antique shop and he carried on trading here until 1950 when we bought 8 High Street and moved his shop there. We know that Claude was the Scout Master during the early 1940’s when it was based in a scout hut in Gloucester Road, opposite the turning to the Shen, but that he resigned to go to the Army. Claude’s shop sold antiques and second hand books. George White, a later owner of 8 High Street remembers Claude selling brass shell-cases from the First World War. When clearing up the shop he bought from Claude, George found a live shell and had to call Bomb Disposal and have it removed. Claude continued trading at 8 High Street until the mid to late 1960’s. They are both listed there in the 1965 electoral register. We understand that Claude retired and sold the business after being approached by the Council to sell off his garden, presumably to enable them to build Castle Court elderly peoples home and provide an access to it (and the adjoining public car park) from the High Street. Claude died in Yeovil in 1998. Nell Gwyn Cafe (sometimes Nell Gwynne) – this was a well known cafe which used the property for many years from the early 1950’s through to the 1980’s. When it was put up for sale in 1955 it was already being referred to as the ‘Nell Gwyn Cafe’. It had three floors. On the ground floor was a dining room, kitchen with Esse Minor Cooker, scullery and boiler room with Ideal water heater. On the first floor was another dining room and sitting room. The second floor had three bedrooms and a bathroom with an Omnia gas geyser. There was also a ladies cloakroom and gentlemen’s lavatory (presumably in the rear) and a cellar. We also have a programme for Thornbury Flower show dated August 1956 which advertises the Nell Gwyn. Sadly it does not mention a proprietor. We have been told that it was run by several groups of people including at one time Mr and Mrs Hall. However we have no dates for these people. The 1958 electoral register shows that Stanley P and Dorothy M James were living at 20 High Street. By 1960 the electoral register shows Cyril and Joan Jordan at 20 High Street. A Thornbury Flower Show programmer for 1961 says that the proprietor of Nell Gwyn was J. M. Jordan. By 1965 they had moved to Glencairn in Park Road in Thornbury. Since the Nell Gwynne closed the property has been used by charity shops. St Peters Hospice were there before they moved to 26 High Street and it is now occupied by ‘Break’, another charity shop, and upstairs by Thornbury Taxsavers. In 1995 a small clothing shop traded there under the name of Zone Menswear.